Although paperback copies of Marlene A. Condon's Nature-Friendly Garden are limited, it is -- we are glad to say -- readily available for e-readers. Reading Condon's book is like observing a game of toppling dominoes in which all the pieces are lined up standing on end in a complex, maze-like pattern. Flick one domino and the whole structure tumbles. Similarly, the author shows how simple choices we make in our gardens have consequences that can build or destroy habitat for a broad range of wildlife and also create pesky imbalances that frustrate gardeners. For example, removing spider webs from bushes and other plants evicts arachnids from their homes and keeps them from doing their jobs. Condon says spider webs are "more attractive than a sticky trap" or bug zapper for "reducing insect populations." She also notes that a shortfall of spiders means less food for birds, which means less birds for snakes and less snakes for hawks. Some readers may feel uncertain about whether they want to invite spiders, snakes and birds of prey into their backyards, but Condon provides clear evidence as to why it is beneficial as well as tips for comfortable coexistence. Oddly enough, Condon was phobic about insects in childhood. It was her inclination toward the sciences and her habit of observing the natural world that helped her to overcome squeamishness and appreciate the role they play in keeping gardens healthy. For gardeners who want to create wildlife habitat, Condon includes a list of plants that attract insects, birds and small mammals. She includes sages (Salvia spp.) due to their nectar as well as seeds that attract songbirds. Condon sees potential in parts of a benignly neglected landscape that others might view as a cleanup project. As a bird lover, she leaves some dead trees on her land so she can fill holes with peanut butter to attract woodpeckers. As a pragmatist, she covers the holes with quarter-inch hardware cloth allowing access only by beaks. Condon doesn't dislike squirrels, but also doesn't want them hogging the goodies when plenty of other food sources are available for rodents in her yard. 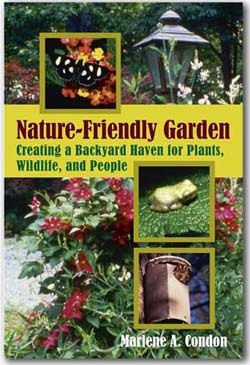 The Nature-Friendly Garden is a good holiday gift, whether you manage to obtain a print copy or purchase it as an eBook for the digitally inclined reader. We highly recommend it.